There are subtle differences between Motocross boots and Enduro or off road boots. The most noticeable difference is in the sole. 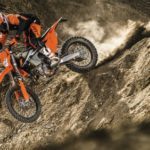 The best dirt bike boots for enduro or off-road riding will feature a sole with a deeper tread pattern for more traction when off the bike, or when negotiating a tricky obstacle like a slippery hill climb. Motocross riders will be looking for a smoother sole to allow the boot to skim the ground when railing through a bermed corner, so a chunky tread pattern is not what they want. They both share the same impact protection qualities, but the best dirt bike boots will also be more flexible in the ankle movement to make walking more comfortable. Adventure riders are looking for different features in a boot from dirt bike riders. Street boots aren’t up to the demands of riding off-road, and dirt-only boots are overkill and lack the comfort needed by adventure touring riders who wear their boots all day, both off and on the bike. Adventure riders may need to do a lot of walking in them, and generally wear their riding pants over the boot, so adventure boots are usually lower, more flexible in the foot, and waterproofing is a requirement given the occasional stream crossing and wet weather riding. With all that in mind, I have reviewed 10 boots, ranging from entry level off-road boots to full-on enduro boots designed for competitive off-road riding, through to adventure boots which fall into that middle ground between street and dirt riding. 1. Sturdy construction: Priority number one for a good boot is to protect your feet and lower legs from impacts. Look for boots with a hard toe box, good shin protection and lots of ankle support and protection. 2. 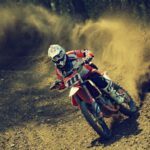 Sole Material: Here is where there is a distinct difference between motocross and enduro boots. Look for a sole with suitable grip for walking and pushing your bike in slippery conditions. In trail and enduro situations there are many times you need to get off the bike to manhandle it. In motocross this rarely happens – it’s a race. 3. Upper Protection: Leather construction of the upper boot gives you good durability and comfort. Even if there is a lot of synthetic material in the upper portion, you will usually see a leather pad on the inner side of the bike where it contacts the bike. It withstands heat better and lasts longer. I have been riding dirt bikes of one kind or another for over 40 years. In that time I have bought and worn out more gear than I care to remember. Do I own every piece of equipment that I write a review on? No. That would cost me 100,000s of dollars. I do my due research to save you the time and give you enough information for you to make an informed decision on what is best for your needs based on my 40 odd years in the business. I eliminate any product from my list that I wouldn’t use myself or be comfortable recommending to my friends. I’ll give you the positives and negatives of the gear, not just the positives. Here are what I consider to be 10 of the best off-road boots available today. 5 Dual Sport/Enduro boots, and 5 Adventure riding boots. The Alpinestars Tech 7 is the third from the top of their boot range, after the Tech 8 and Tech 10. The Tech 7 Enduro is specifically designed for enduro and off-road riders. The smooth MX sole doesn’t work for off-road use, so there is a new dual compound sole with a softer compound at the instep area for good grip on the footpegs, and a sole more suited to walking on muddy trails. The whole foot shell is now a single plastic molding to give a more streamlined lower profile. It replaces the stitched sole of earlier models. The ‘Biomechanical Pivot’ hinge system gives the boot good flexibility at the ankle, better feel for gear shifting and braking, and makes them easier to walk in. The back of the boot features a new TPU blade system which the guards the ankle joint against hyperflexion, which could prevent a broken ankle. The redesigned buckle system has a memory setting so that you only have to adjust them once, and are easy to operate even when caked with mud. An innovative buckle closure system which includes high-impact aluminum bridge closures, with memory settings and a quick release locking system with self-aligning design for a precise closure. All buckles are replaceable. 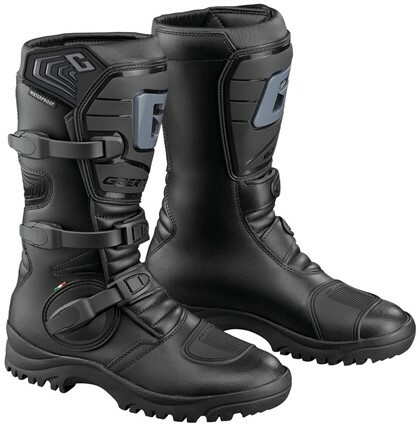 The Gaerne SG-12 Boots are regarded by many as the best off-road motorcycle boot on the planet! Numerous dirt bike magazines have tested the boots and come back with a 5-star rating for being the most durable, comfortable and supportive boot available to date. Gaerne has been manufacturing motorcycle footwear for over 50 years and completely centralize design, construction and quality control under one roof in northern Italy, just outside of Treviso. The result is a premium boot with no compromises. A unique feature on the SG-12 is that the shin plate can be adjusted to accommodate larger calf sizes or a knee brace. By simply removing 3 Philips head screws the upper boot enclosure can be adjusted to one of three different positions. This is great for anyone who has tried fitting a knee brace or protector into your boots. Lower spec boots typically have stiff uppers and soft soles, making them uncomfortable to wear and too stiff to easily manipulate foot controls. The soft soles also transfer a lot of impacts directly to the rider’s feet. The SG-12 takes the opposite approach. The pivot hinge provides good flex at the ankle giving foot controls more feel, and the sole is stiff enough to absorb impacts through the pegs, but not too stiff to walk around in. Combine that with a soft memory foam footbed in the interior of the boot and these boots are comfortable to wear all day. The new SG-12 even features a new ‘G’ logo for an exciting first impression. If hard riding is your passion, and you want high-end Italian design that works exceedingly well, the Gaerne SG-12 is a sure bet. Dual Stage Pivot System: This patented system is exclusive to Gaerne. The first pivot is attached to the ‘Razorback’ and provides strong lateral support, while a glide-plate keeps the upper boot firmly in an upright position. The second pivot is fixed on a sliding guide that allows your foot to feel natural on the peg while shifting and breaking. It will ‘bottom out’ and absorb shock in the case of unwanted compression. Front Plate/Shin Guard: The new Thermoplastic shin plate is anatomically shaped to give you a perfect fit. Removing three screws can make the opening wider for a larger calf or accommodate a knee brace. Buckle System: Four lightweight alloy buckles provide an ‘easy in’ and ‘easy out’ of the boot. Gaiter: The new Swiss breathable fabric called Acronos is extremely stretchy and shaped to keep sand and dirt out. Interior Lining: ‘Gaerne Memory Cell Foam’ lined for a comfortable fit and feel. Heel Cup: New design to absorb shock in the case of rear compression, and a nice place for the new ‘G’ logo. Toe-Box: New design features a slimmer shape for an improved feel of your bike’s controls. Toe Cap: Has been redesigned with a new shape and reinforced for toughness. Sole: New look sole is ‘Dual Composite’ anti-shock rubber for improved grip on and off the bike. Insole: A new molded footbed to correctly support your foot. At the heel, a new shock absorbing material has been used, and the front portion has been redesigned to allow the foot to vent. The Alpinestars Tech 3 Enduro Boot is the Alpinestars entry level boot at the lower price range of just over $200. They’re a great value-for-money for riders new to the game, or even more experienced riders. It has features that are normally found in higher priced boots. The Tech 3 replaces the old Tech 1 and Tech 3, now there is just the new Tech 3. It shares a lot of the features of the Tech 5 and Tech 7. The most noticeable difference is that there are 3 buckles, not 4 and they are a Polymer and not aluminum like the Tech 5 and 7. The only difference between the Enduro and the Motocross version is in the sole. The Enduro has more of a lug style tread better for off-road use, and again it is replaceable like the Tech 5 and 7. There is a generous amount of TPU on the inner side of the boot for grip and heat resistance from your bike, and the accordion stretch panels extend all the way up the back of the boot. If you’re looking for a name brand boot, without blowing the budget, these may be the answer. From all reports, the sizing is pretty accurate, so whatever size you normally wear, is the size to order. 3 buckles with memory featuring a quick release/locking system. The buckles are injected with a high impact resistant technopolymer with a ratchet memory and self-aligning for precise closure. All buckles are replaceable. It shares many of the key attributes of the original Instinct motocross boot but has improvements for off-road use both walking and riding. The Duratac rubber compound on the sole features a larger open lug pattern for exceptional traction while navigating challenging obstacles like wet rocks, roots or muddy hill climbs. The full coverage toe box gives added protection without affecting shifting and braking. A great feature is the hinge lockout system which is designed to stop the motion of the ankle before hyperextension takes place, possibly saving you from a broken ankle. The Duratec compound is also used on the burn guard on the inner side of the boot, adding to your grip on the bike. 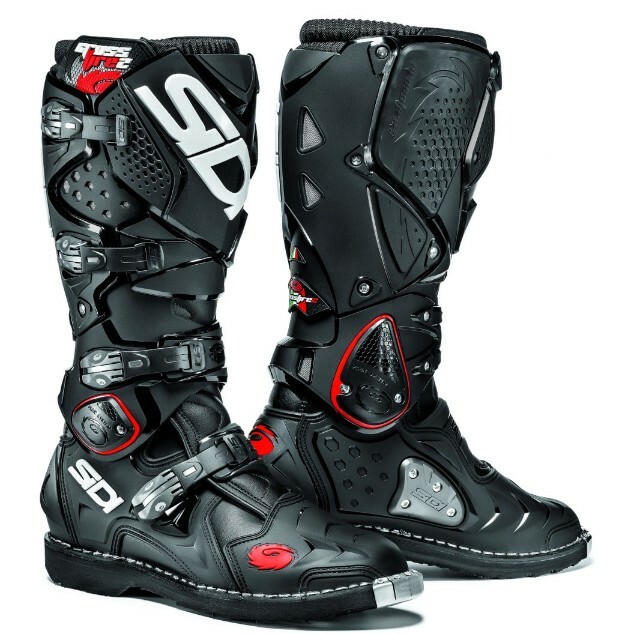 Sidi has for many years dominated the European market, and since the company has gone global one of the main reasons for their success has been the Sidi Crossfire 2 SRS boot range. The Sidi Crossfire 2 SRS is a top of the line motocross boot, but I have included it as an enduro boot because of the unique SRS (Sole Replacement System) that allows you to easily swap out the sole in a matter of minutes, depending on the type of riding you’re doing that day. The sole can be swapped from the smooth MX sole to the E1 Enduro sole or even the Supermoto sole, which makes this boot a versatile choice. A laminated 3mm thick ‘Technomicro’ material is used as the base material in all areas of the boot. A great feature is the calf plate system with an inner double adjustment that expands to suit different calf sizes or to accommodate a knee brace. The insoles are made from nylon and a rigid, shock-resistant, anatomically shaped heel is designed to hold your foot firm and resist twisting. The SRS is lined with an anti-abrasion Cambrelle in the foot area and the upper is lined with Teflon mesh which helps prevent absorption of water and sweat. The buckle system can be a point of frustration on some boots, especially after a muddy ride, but the replaceable cam-lock system on the Sidi is easily operated, micro-adjustable and needs to only be done once. 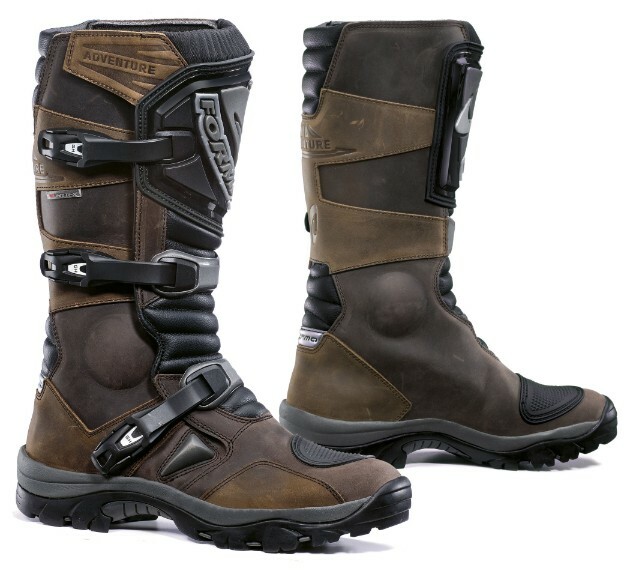 The Gaerne G-Adventure Boot was designed with the adventure touring, dual sport and ATV rider in mind. It is Dual sport ‘crossover’ type of boot giving you mix between a rugged off-road boot and a road touring boot, with a mix of features that are both stylish and comfortable as well as protective. It is in the under $300 price range that gives you good bang for your buck. The G-Adventure is waterproof and breathable through a built-in membrane within the boot that is non-removable. It is designed to keep the water and elements out while wicking the sweat away from your foot and allowing it to evaporate through the membrane keeping your foot cool and dry. The high-grip lug style sole gives you a good grip on the ground and is comfortable to walk in. There is a good amount of TPU protection at the front of the boot to protect your shin from impacts. The leather gaitor gives you a good seal around your leg whether you wear your pants over or under the boots. They come in one color only, black. 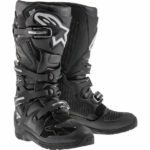 The Alpinestars Corozal Adventure Drystar Boots are the baby brother to the Alpinestars Toucan Gore-Tex touring boots (at No. 9) which sell for an additional $200. The Corozal is an excellent boot in the under $300 price range which is packed with protective features normally found in higher end boots, such as the polymer shin plate and the lateral ankle protection with the biomechanical link between the upper boot and lower foot structure. The Corozal is a 50/50 blend between the dirt bike boot and the softer touring boot. You’re getting some of the DNA of the full dirt boot, but with the creature comforts of the touring boot. It can be worn with your riding pants over or under the boots, and the waterproof capability and comfort both on and off the bike make this boot very popular with adventure riders. Multi-material construction incorporating PU-coated leather, microfiber and suede leather for comfort, durability and abrasion resistance. Extensive front and lower rear accordion flex zones constructed from microfiber for comfort and freedom of movement. Breathable textile interior lining throughout the boot. Integrated breathable DRYSTAR membrane for all-weather performance to keep your feet dry. Internal high modulus polyamide insole with integrated steel shank reinforcement for support to the arch area. The midsole is constructed from molded PU foam for lighter weight. Lateral ankle protection with a biomechanical blade-link between the upper boot and the lower foot structure. TPU shift pad on the top of the foot with patterning for improved control of the gear lever. Lightweight polymer shin-plate and lateral ankle protection for impact resistance and support. Medial and lateral dual density ankle protector disks which are incorporated into the boot chassis for strategic ankle protection. New buckle closure system which allows for easy in and out. The buckles are a durable TPU and glass fiber reinforced Nylon for weight saving. They include a micro-ratchet memory system for quick and precise closure. All buckles are replaceable. Wide-entry aperture opening for easy in/out plus a secure upper TPR and Velcro closure system which allows for a wide range of calf sizes, or fitting knee guards. Highly flexible sole tread features a vulcanized rubber compound for comfort and grip when walking. Removable anatomic footbed includes EVA foam and Lycra for comfort and support. Ergonomic shaping for forefoot streamlining which enables greater control of bike’s gear shift and brake controls. The Forma Adventure boots are designed specifically with the adventure rider in mind. They combine the comfort of a road boot with the extra protective features and full height of an off-road boot. They have a vintage leather finish which is great for those who love the classic leather boot with its durability and flexibility. 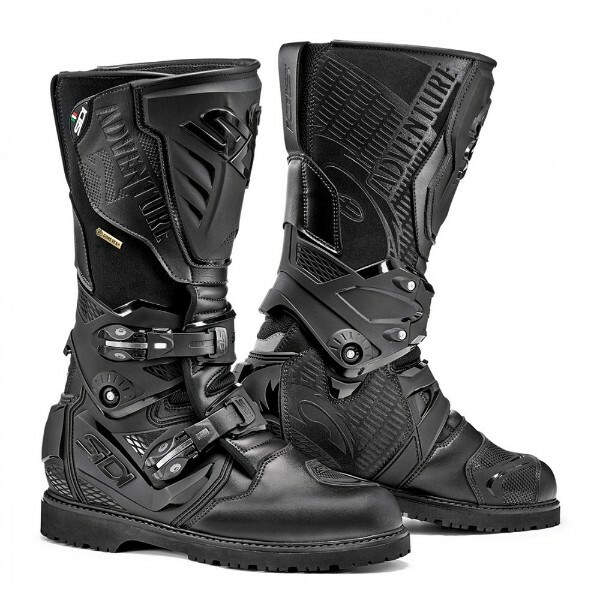 You only have to look at them to see that they’re a well-designed adventure motorcycle boot with great aesthetics. The ‘Drytex’ waterproof and breathable lining keeps your feet dry and doesn’t limit the range of motion, very important for adventure and off-road riders. The double density sole gives you superb grip on the bike and a grippy surface to walk on when off the bike. Be aware, however, the sole is thin and not designed for bikes with aggressive MX style footpegs. As far as protection goes, they are OK, but not as protective as the full-on enduro boot. The heel cup and toe box are relatively soft, which adds to the comfort, great for adventure riding, but for aggressive off-road riding, you may want something a little stiffer. The integrated TPU inserts and reinforcements give you additional protection from impacts. The buckles, while plastic are claimed to be unbreakable. I have found no reports of breakage. The Forma is also available in the Low Boot version which some adventure riders prefer, saving you about $30. 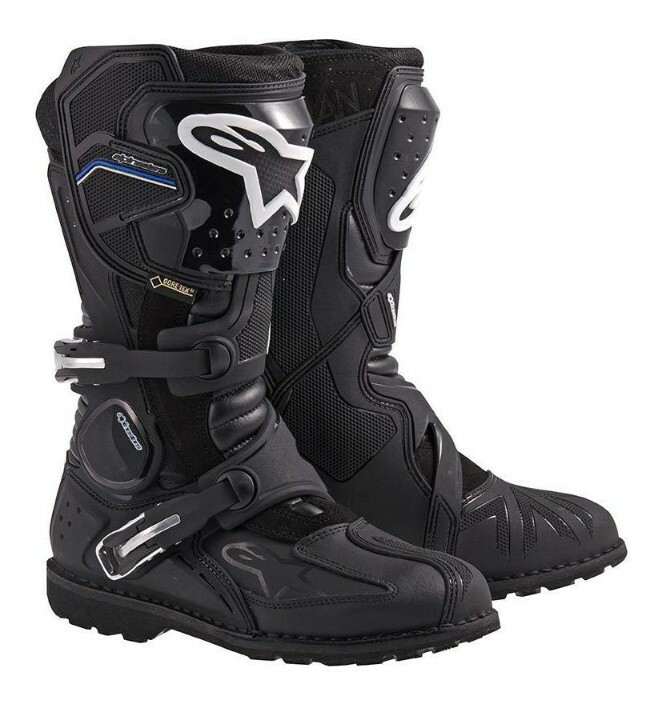 The Alpinestars Toucan Gore-Tex Touring Boots meet the needs of the adventure riders by landing squarely in the middle ground between road and off-road extremes. They are the bigger brother to the Alpinestars Corozal Adventure Drystar boots at number 7 in this review, and the Italian brand’s top-level adventure boot. They offer all-day comfort in a waterproof boot that provides all the protection you’ll need when riding your adventure bike off-road. They’re stiffer to walk in than street boots, but they don’t need any break-in period, you can use them right out of the box. Putting them on is easier than most dirt bike boots. There are only 2 aluminum buckles which provide a secure closure combined with a wide velcro patch at the top of the boot. The innovative locking system is very fast and self-aligning and all buckles are easily replaceable. The attention to detail is obvious with this premium boot. It combines leather and suede construction with CE certified armor protection and a 100% waterproof yet breathable Gore-Tex liner. All the impact areas, toe, heel, ankle, and shin are well protected and the articulated joint in the ankle armor provides flexibility for walking and operating the gear shift and brake. It’s a little simpler than the hinge system on the Sidi Adventure and appears to limit the flexion of the ankle a little more. The innovative lateral ankle protection system is flexible and acts as an axis between the upper and lower parts of the boot. The inner side of the boot is contoured and has polymer reinforcements which aid in gripping your bike and providing heat protection from your bike. The inner heel and toe, which are the highest impact areas of the boot are covered with a protective layer of TPU. The steel-shanked sole has a unique hexagonal pattern of tread to aid traction both on and off your bike. 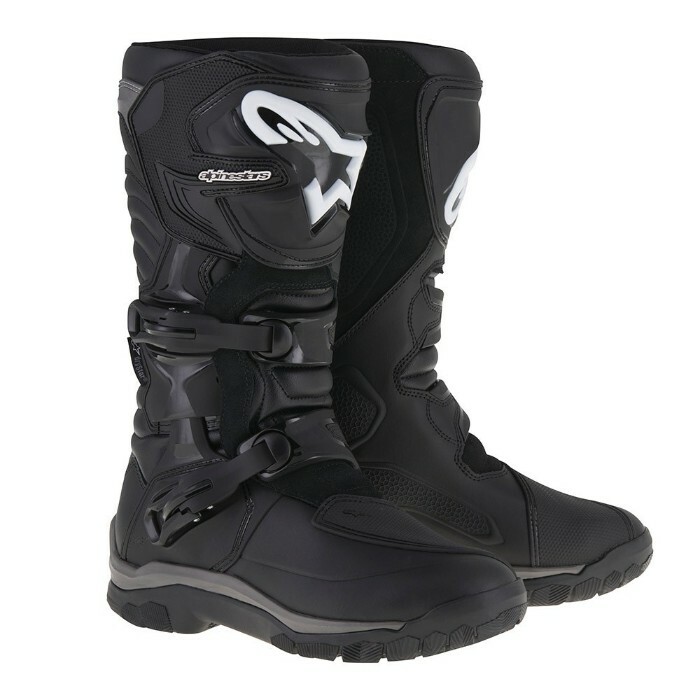 The boots can be worn both over and under your riding pants leg. Sidi adventure motorcycle boots have been the standard by which all others are measured for a number of years. With the Adventure 2, they have made a brilliant boot even better. A higher Gore-Tex gaiter which is 3 inches (7cm) higher than previous models. It is now the full height of the boot for increased waterproofing (great when fording water crossings). It is now the highest Gore-Tex waterproof liner on the market. You’re getting 14″ of coverage from your sole to your calf. There is a more flexible shaft to accommodate a wider range of calf sizes, and generally more flexibility throughout the boot due to strategically placed flex zones. There are now two new flex zones at the front of the ankle, and one above the heel. So they feel comfortable right out of the box and are better for walking in. The ankle flex system, tongue-in-groove Achilles protector and other TPUs have been refined to give a slimmer overall profile and less bulky feel. Sidi has now included a hinge on the ankles, which gives more flex when walking and operating your controls on the bike. It’s responsible for what Sidi has become known for – the ‘Sidi Squeak’. It’s hardly a deal breaker but if that doesn’t bother you, these boots are as good as it gets, they’re one of the best all-weather on/off road adventure boots money can buy. The only other adventure boots in their class for overall performance are the Alpinestars Toucans, at number 9 in this review. We have looked at boots ranging from entry level off-road boots to full-on Enduro boots designed entirely for competitive off-road riding, through to adventure boots for riders looking for all-day comfort, without looking like a storm-trooper with all the dirt-only protective features. Top Pick: The Alpinestars Tech 7: Has all the features you are looking for in an off-road boot but without the top of the range price tag. They will handle any off-road riding situation whether casual weekend trail riding on your dual sport bike or competitive Enduro racing. 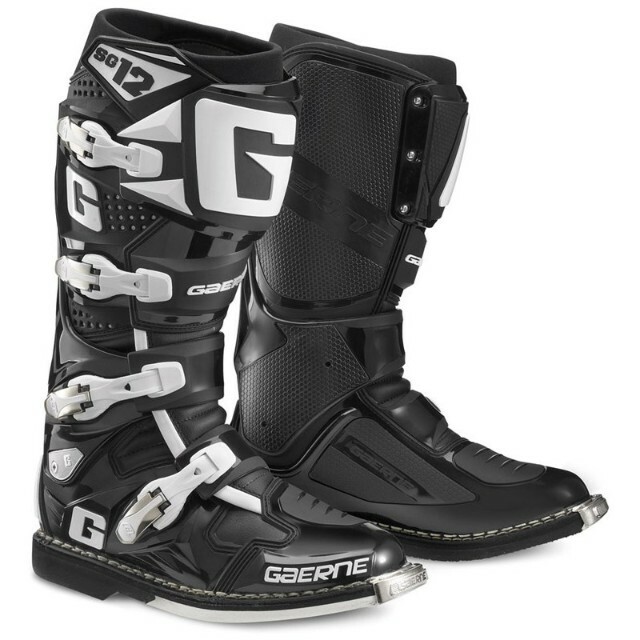 Best High-End Off-road Boot: Gaerne SG-12 Boots: When you simply want the best protection possible for off-road riding, the SG-12 is widely regarded as the best-of-the-best. The only boot that can compete with it is from that other Italian manufacturer, the Sidi Crossfire 2 SRS. It is really only a matter of brand loyalty that separate them. You can’t go wrong with either. Best Budget Off-road Boot: Alpinestars Tech 3 Enduro Boots. An entry level boot that has a lot of the protective features of the Tech 5, Tech 7 and other higher priced boots, but at a price that will suit the new rider not wanting to spend a lot of money. Best Budget Adventure Boot: Gaerne G-Adventure Boots. This stylish waterproof adventure boot is ‘Bang for your buck’ if you are getting into adventure riding and looking for all-day comfort and some off-road protection without blowing the budget. And it’s a Gaerne! Best High-End Adventure Boot: Sidi Adventure 2 Goretex Boots. If you’re serious about your adventure riding and want the best there is available. The only boot in its class that comes near is the Alpinestars Toucan Gore-Tex Boot. Again, there’s so little in it that your decision will probably come down to brand loyalty as to which way you go. Both are in a class of their own. 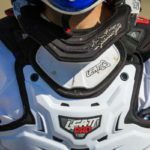 Best Knee Braces & Knee Guards for Dirt Bikes 2019 – Which To Choose? Have you used any of the boots in this review? Are you using a boot that has served you well over the years? Please feel free to leave your thoughts in the comments below. First of all, they look amazing! I love how you educate us about the important aspects of choosing the right boots. I do have some questions though. As a beginner, do you think I should invest in a good pair of boots from the get go? Is it really that crucial for the sport? I’m just getting started and don’t really know if this could become a long term hobby. I would hate to buy some expensive equipment and regret it later, like many of my other interests. Hi Wei, thanks for your comments. 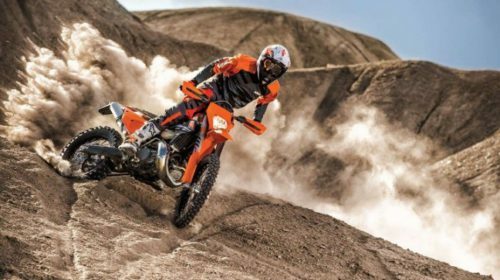 Your choice of boot depends a lot on the type of riding you do and how much off-road riding you do. If you’re just getting started and don’t want to spend a lot of money, the Alpinestars Tech 3 has a lot of the features of the more expensive boots but you’re only spending about $200. If a lot of the riding you do is on the road, maybe an adventure riding boot is a better choice, especially if you want to wear them all day and walk around in them. The Gaerne G-adventure boot is the cheapest of the adventure boots in the review at about $250. All the boots in the review are excellent boots, you can’t go wrong with any of them. Hope this helps. Let me know if I can be of any more help. Thanks for stopping in. Hi and thanks for your comments. Yes, the Alpinestars Tech 3 is a great boot and is good value for money. 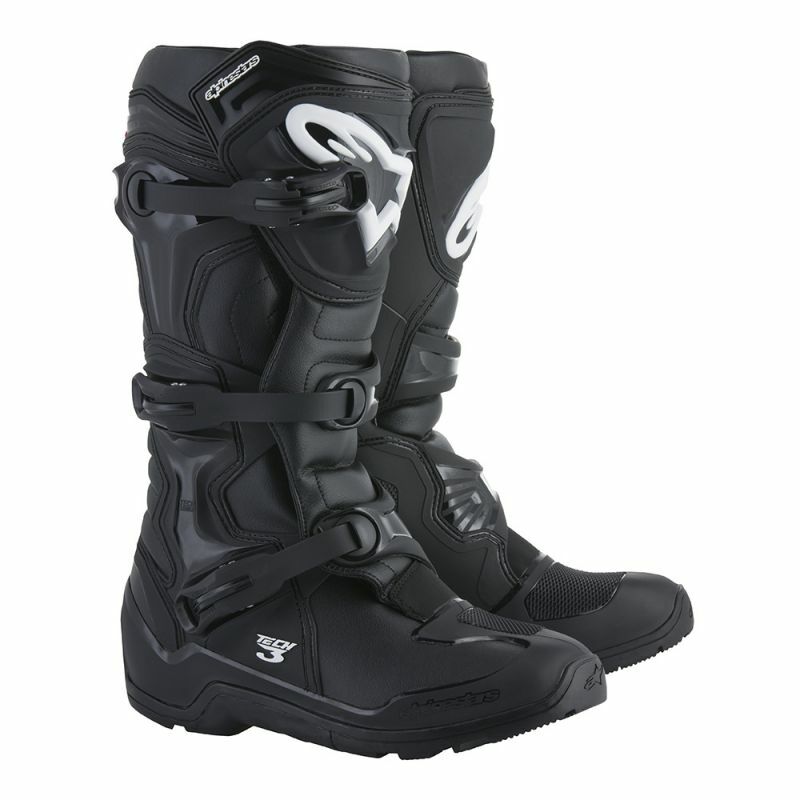 Being an Alpinestars you know you are getting a top quality boot, even at the lower end of the price scale. I’m using the Alpinestars Toucan Gore-Tex Touring Boots for my biking adventure. I bought this boot because of the terrain around my neighborhood. It’s a muddy area with pines and broken pieces of woods. The boot affords me the comfort and luxury because of its breathable feature and protective layer of TPU. Hi Sammy. The Toucan is a top of the line boot, you can’t go wrong there. Good choice. 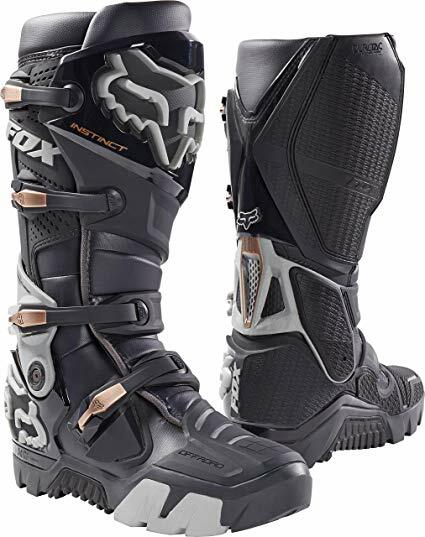 Hello Greg, you have vividly described the different features one need to look out for when purchasing boots for either motocross riding or off road riding. The sole makes all the difference because getting boot with wrong sole can lead to some difficulty in climbing slippery places. Of all the endure boots you reviewed, I specifically love Gaerne SG 12 Boots. I love the fact that the shin plate can be adjusted to accommodate larger calf sizes or knee brace. Its features are simply wonderful, especially the Insole feature. Hi Gracen. The Gaerne is a top of the line boot. It has everything you could want in a dirt bike boot, no compromises. Thanks for your comments. Thanks for sharing this article on 10 best boots for Enduro and dual sport driving. I love the boots and the different specifications and features you gave in this article. I agree with you that sturdy construction, sole material and upper protection are most important things to consider in getting a dirt bike boot. And among the lots I think the Alpinestars Tech 3 Enduro Boots is appealing to me because of its replaceable sole and as well it is low priced. I can use this to go on my riding on weekends. Thanks for sharing this article. The Alpinestars Tech 3 is a very popular boot at the lower end of the price scale, without sacrificing a lot of safety features. I have no hesitation in recommending it, I have heard no negative reviews about it. Thanks for your comments. I will like to commend your effort in writing this great article about the 10 Best Boots For Enduro and Dual Sport Riding…my elder brother is really into Bike riding, and the he has been about the bike boot he just acquired, saying that it is too heavy. I will like to know if there will be another recommendation for him or if they are generally heavy? Hi Barry. What type of riding does your brother do? Is he mainly riding off-road, or is some of his riding on the road? Generally, the more off-road orientated boots are a bit heavier due to all the protection on them, about 6 or 7 pounds. The lightest boot in the review is the Gaerne G-Adventure boot at about 3 pounds. It is designed for about 50/50 on/off-road. Some of the boots in the review are designed to be lightweight. It all depends on the type of riding he does. You can get away with less of the protective features, and therefore use a lighter boot if most of your riding is on the road.